Now the fun begins. This is the first in a series of posts on how to raise various vegetables, how to feed them, defend them, harvest and use them. We start with one of my favorites and a vegetable that is very easy (and forgiving) to raise. If you’re new to gardening, you might want to start with a few tomato plants instead of starting seed. If you are starting seeds, indoors, you’d have to get the seeds in the peat pots for most warm weather crops, like tomatoes, 8 to 10 weeks before your last frost. In Zone 6a, that means I am in the basement, filling peat pots and dropping in seeds in the last week of February. From the moment the seeds go into the pots until I get them ready for transplant, I have to pay attention – keep them warm, water them, feed them and ensure they are healthy and happy. Tomatoes come in both these varieties. What’s the difference? Determinate varieties bear their crop all at once and tend to be more compact. Don’t have much space? Try these. Indeterminate tomatoes bear fruit over the course of a season and grow longer vines that require support (staking or caging) over the growing season. Got room and a couple of fence sections? Try these. Plums – the kind you can use to make great tomato paste or pasta sauce with. Slicers – great for burgers or sliced and served with just a salt shaker. Cherry or Grape Tomatoes – tiny bundles of tomato flavor that taste great right off the vine. Tomatoes are warm weather plants; they really don’t like cold soil or cold air. You can plant them out on the ragged fringe of your last frost date but putting them in the ground too early may just stunt their growth. So tomatoes should not go into your ground until the soil temperature is at least 60 degrees. Tomatoes should be given some room to breathe. Plants should be 2 to 3 feet apart and rows should be 3 feet apart. This gives the tomato plants room to spread out, especially the indeterminate ones that can grow vines that are 6 feet long. Remove all containers (plastic or clay) from the plants except peat pots. If using peat pots, just grasp the bottom and start to close your fist. That punches small holes in the bottom that roots can slide through quickly. Mulch with straw around each transplant. Mulching also makes for a weed free garden – the only state I want to be in when it comes to gardening. It also ensures that moisture is retained and to make sure rain water doesn’t splash up on the leaves of the tomato plants. Water that splashes up off the soil can cause verticulum wilt or mosaic tobacco virus, the two most common diseases in the tomato family. By the way, never smoke in your garden – you can make your plants sick, literally. Tomatoes should get 1 to 2 inches of rain a week. If it doesn’t rain, make sure you water them. I use the Gilmour Flat Weeper hose – the best soaker hose on the market today and it comes with a lifetime guarantee! Soaker hoses save water and prevent the spread of soil borne diseases. Keep an eye out for the tomato hornworm – a big green caterpillar that likes to eat tomato plants. If you see one and you don’t have trichogamma wasps, use pliers if you have to but pull it off and kill it. If you have trichogamma wasps, sit back and watch the show. 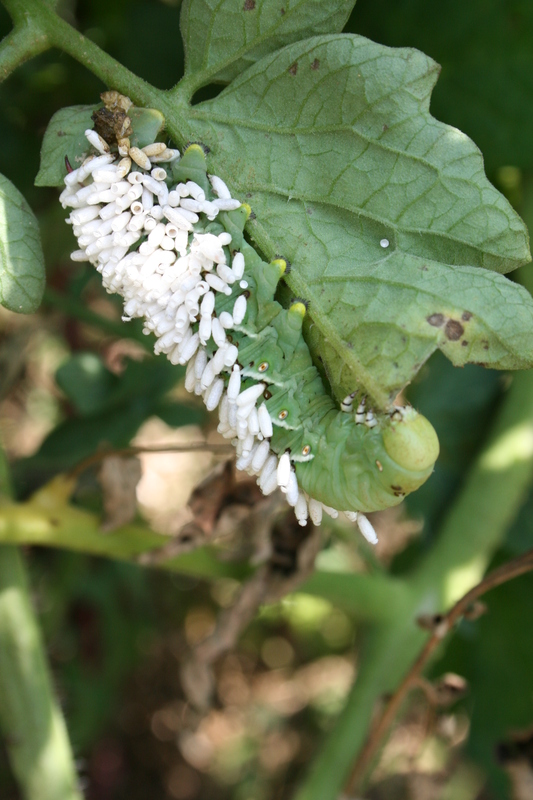 The wasps lay eggs on the hornworm and the larva hatch and dine on their host. It’s not pretty but the wasps are an effective and natural control for these very destructive pests. If you planted indeterminate tomatoes, take a few minutes a week to check for and remove the axillary or side shoots that come off the plant. But don’t go crazy and strip off a whole lot of leaves. Tomatoes can get sunburned – really – and burned fruit just doesn’t taste all that good. So trim lightly to keep the plants from becoming too bushy and allow them to push that energy into fruit production.Fertilize your tomato plants when the fruit are about 1/3rd grown. I use fish emulsion mixed with water and poured around the roots of every plant. This is sometimes called “side-dressing” a plant. Another fertilizer you could use is calcium nitrate but don’t get this on the leaves of the plant. Just mix it gently into the top inch of soil at the base of the plant. If using this fertilizer, make sure you water it in, too. Next week, how to identify diseases that attack tomatoes and what to do with all those plump, juicy, tomatoes growing on your vines. This entry was posted in Gardening Tips, Organic Gardening and tagged August, Cherry, Garden, Growing season, how to grow tomatoes, indeterminate tomatoes, organic gardening, Plant, Seed, Sowing, Tomato, tomato plants, tomato seeds. Bookmark the permalink. Excellent post, Pat. I’m putting it on my Scoop page! Thanks! I am so glad you liked it. I just posted the second half of tomato rearing – diseases, bugs and recipes. That sounds odd! Let me know what you think, please. Hi Pat – great post and one that I will refer to in the spring. Can I add a link to your post in my blog (www.kalegrower.wordpress.com). I will be blogging about a gift of heritage seeds plus some advice from my italian tomato-growing colleague. I won’t be posting until the end of the weekend, and it is okay if you don’t want me to refer to your post. Thanks for the pingback and so very glad you like the posts! I love organic gardening and just want to share what I know and learn from everyone else. Glad you found it interesting. I love raising tomatoes and it is pretty easy to get a crop but there are some tricky pests and diseases that can ruin everything. I shared the ones I know about but if you have others, please share them too!